Like every IM application, MSN also save chatting history in the form of chat logs. MSN Merge is small tool to merge such chat history log files. It processes different XML files of chat logs and produces single merged chat history log file containing all the combine data. 1. 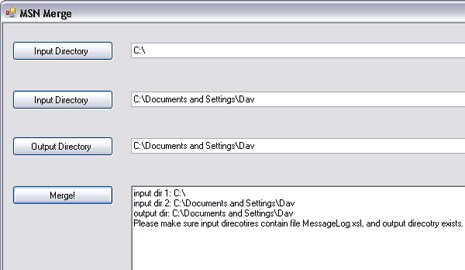 Chat logs with distinct filenames are directly copied to output directory. 2. Chat logs with same filenames are merged, ordered by date & time to output directory. 3) Only XML chat log files will be processed.